This set of Wireless & Mobile Communications online quiz focuses on “Orthogonal Frequency Division Multiple Access (OFDMA)”. Explanation: Orthogonal frequency-division multiple access (OFDMA) is a multi-user version of the popular orthogonal frequency-division multiplexing (OFDM) digital modulation scheme. Multiple access is achieved in OFDMA by assigning subsets of subcarriers to individual users. 2. Why is a cyclic prefix required in an OFDMA? Explanation: Use of cyclic prefix is a key element of enabling the OFDM signal to operate reliably. The cyclic prefix acts as a buffer region or guard interval to protect the OFDM signals from intersymbol interference. 3. What does the DC subcarrier indicate? Explanation: All the subcarriers of an OFDM symbol do not carry useful data. In OFDM and OFDMA PHY layers, the DC subcarrier is the subcarrier whose frequency is equal to the RF centre frequency of the transmitting station. 4. What processing step combines multiple OFDM subcarriers into a single signal for transmission? Explanation: IFFT combines multiple OFDM subcarriers into a single signal for transmission. These transforms are important from the OFDM perspective because they can be viewed as mapping digitally modulated input data (data symbols) onto orthogonal subcarriers. 5. Which property of OFDMA system allows adjacent subcarriers to be used without interference? Explanation: Orthogonality of sub-carriers simply means their correlation is zero. Orthogonality in OFDMA system allows adjacent subcarriers to be used without interference. 6. In OFDMA, what is the relationship between the subcarrier spacing f and symbol time t? Explanation: In OFDMA, relationship between the subcarrier spacing f and symbol time t is f=1/t. They are inversely proportional. 7. OFDM is a technique for 3G mobile communication. State whether True or False. Explanation: OFDM has developed into a popular scheme for wideband digital communication, used in applications such as digital television and audio broadcasting, DSL internet access, wireless networks, power line networks, and 4G mobile communications. 8. OFDM uses complex equalizers. Explanation: ODMA does not use complex equalizers. In OFDM, the equalizer only has to multiply each detected sub-carrier (each Fourier coefficient) in each OFDM symbol by a constant complex number, or a rarely changed value. Explanation: OFDM uses the same bandwidth to deliver roughly the same data rate as a single carrier modulation by introducing multiple lower-bandwidth channels. Each of the lower-bandwidth channels has a lower rate, and by combining them together, the original rate is achieved. Explanation: The IEEE 802.11a standard specifies a modulation that divides a high-speed serial information signal into multiple lower-speed sub signals. Common data rates of IEEE 802.11 OFDM is 18 Mbps. 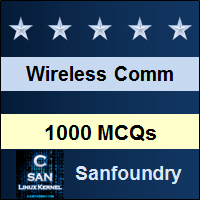 To practice all areas of Wireless & Mobile Communications for online Quizzes, here is complete set of 1000+ Multiple Choice Questions and Answers.